When an evening at the theater goes horribly awry, Richard Hannay finds himself on the run from the law, and before long in the depths of an international conspiracy which he must uncover in order to clear his own name. Needless to say, hilarity ensues. 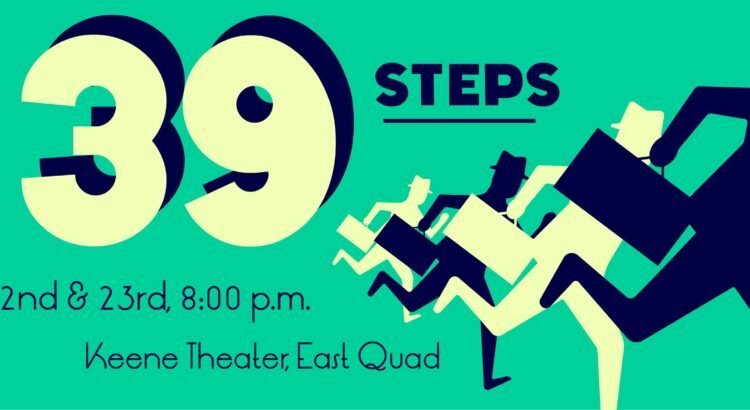 Another thing that is deceptively simple — that is — appears to be simpler than it actually is, is Patrick Barlow’s The 39 Steps. This not to be confused with Alfred Hitchcock’s The 39 Steps, or, god forbid, John Buchan’s The 39 Steps. Patrick Barlow’s The 39 Steps is a reworking of Simon Corble and Nobby Dimon’s The 39 Steps, itself an adaptation of Hitchcock’s, in turn based on Buchan’s. I cannot speak to Corble and Dimon’s interpretation, but Barlow’s interpretation of their interpretation is a Monty Python-esque reimagining of Hitchcock’s spy thriller, which calls for four skilled actors, and not much else. Sets are kept minimal by necessity, as the play changes location on a dime, and and costumes are sometimes limited to an array of jackets and hats, as they need to be changed even faster. It is a play which practically seems designed for small-scale community theater, due to its lighthearted nature and apparently low technical demands. But this is by no means easy, and retelling an entire adventure novel with just four people can leave one short of breath. The RC Players, whose production of The 39 Steps opens March 22nd at the Keene Theater in East Quad, have assembled the requisite cast of four funny people. Sushrut Athavale leads the cast as the pencil-moustached Richard Hannay, cool and quippy, though not himself immune to comic outbursts, Hannay is the perennial leading man, and, to this end, Athavale is the only actor who plays just one role through the entire performance. In a farce, it is easy to forget about the straight man, who acts to ground the antics of the more absurd characters, but the role is one essential to the genre, and requires a comic talent of its own which Athavale certainly possesses. He is opposite Maria LoCicero, who first appears as inciting-incident-on-feet Annabella Schmidt. Once Schmidt’s plot utility is exhausted, LoCicero portrays two other characters, the Scottish Margaret, who, like Ms. Schmidt, is something of a one-scene wonder, and Pamela Edwards, the persona in which the actress spends most of her time on stage. Still, all three characters fall under scrutiny, and LoCicero does a marvelous job portraying each as distinct and uniquely entertaining. Athavale and LoCicero are joined by JD Benison and Nicholas Megahan as the two aptly-named Clowns, who portray between them literally every other character in the play. They change their voices and costumes seemingly every sixty seconds, sometimes more, sometimes even handing characters off from one to the other in a daisy chain of hat and jacket switching. They certainly have the flashiest parts of the play, and the quick-paced broad comedy that characterizes many scenes rests squarely on their shoulders. There is one element inherent to farce which I cannot review for myself, and that is how live comedy feeds on the audience. The broader the comedy, the more it feeds. To that end, the cast in a farce must always be on alert, careful to time their jokes to the tempo of the audience they have any given night. Thus a farce will always be continuing to find its shape, and the actors must be up to the task. Without seeing every performance in this run, I cannot say whether they are or not, but my strong suspicion is that they absolutely are. The 39 Steps has a metatheatrical element to its comedy as well, which was splendidly executed throughout. Director Sam Allen has done some wonderful space work, which was perhaps most notable in a scene set on a moving train. I do not wish to go too far into it lest I give anything away, but let it be said that both the interior and exterior of the train were perfectly embodied and practically visible in what was, in fact, empty space, which had an exhilaratingly comic effect. In some ways, the less-furnished scenes were more impressive than the scenes that had a full contingent of chairs, tables, windows and doors, because the less that is literally portrayed, the more the cast and creative team have to come up with inventive and humorous ways to convey the same information to the audience. Suffice it to say that the bits of comedy which leaned on the fourth wall were, I thought, the most humorous moments. One moment which was very funny, but which I wish had been leaned into even more, was a moment near the end of the play where even the actors playing the characters seem to get in on the comedy, the actors themselves becoming characters, bringing us to almost Brechtian levels of verfremdungseffekt. Speaking of meta-comedy, if I can make one nerdy nitpick, it is that the references to other Hitchcock films which litter the play (for instance, one character refers to the “Rear Window” of a house) were, with the exception of one, entirely played down, unemphasized, and, if I recall correctly, in one instance cut altogether. Now, I will be the first to say that the exclusion of reference humor is hardly something that should hamper one’s enjoyment of the play. I have myself criticized plays for relying too much on reference humor, which is exceedingly audience-dependent and often awkward to pull off. At the same time, given the abundance of jokes of all sort in The 39 Steps, (if you don’t get one joke, there’ll be four more in thirty seconds one of which you will) I don’t think the relatively small amount of reference humor works against it, and I don’t think it hurts to lean into it in this instance. On the other hand, this is a very minor nitpick, and will also only be noticed by the extreme Hitchcock geeks in the audience who also happen to have seen or read this play before. Which, for this production (though I haven’t done the demographic surveys) is probably a relatively small percentage. Natan Zamansky is an aspiring dramaturg, with particular interest in opera and light opera. He is a regular performer with the University of Michigan Gilbert and Sullivan Society, and likes elephants.